Hi there! My name’s Nicole Rusk, and I’m a 3D prop and environment artist who likes to play around with all kinds of different styles. 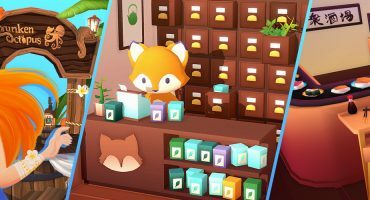 Currently, I work freelance on indie games, or on personal art or game projects with my husband. Like most artists, I’ve been doing art of some sort since I was very young. And also like most artists, my path to where I am now has been anything but linear. In high school, I was most interested in becoming a graphic designer, and even maintained an anime graphics website called “Anime Rain” (teenage me sure knew how to name things). While my parents were supportive of this pastime, they were most encouraging of the coding aspect of things and pushed me more in that direction. Even though I would have loved studying art in college, I did still enjoy working in HTML so I decided to give programming a try. I ended up attending the University of California, Santa Cruz and getting a computer science degree in game design. While it was an engineering-focused program, I found myself drawn to creating the art more than the code. I struggled with truly enjoying the programming process, and opted to become “the artist” of the group for most class projects. Shortly after graduating, a family friend referred me for a contract web developer job that was both part-time and remote. With school pressures out of the way and a flexible job secured, I decided that I could finally dedicate more time to pursuing game art professionally. Since then, I’ve been leveling up my art skills and learning as much as I can through practice and all of the wonderful free online resources that exist. This has meant doing countless studies, finishing personal “homework assignments”, watching hours of videos of professionals demonstrating their craft, and of course creating art for games. I even got to work with some close college friends on a mobile game called Alpaca Party, which was successfully funded through Kickstarter and published on iOS and Android! Now that I was set on becoming a game artist, I needed to figure out what kind of game artist I wanted to be. At first, I wanted to be a concept artist. Who doesn’t love seeing the beautiful early illustrations of elven forest cities, or the initial sketches of the powerful heroine, or the hundreds of ideas drawn up for the Great Magical Staff? I dove in to learning color theory and studying the concept art of my favorite games. While I was enjoying what I was practicing, I knew I had a lot to catch up on, and often fell back to cartoony art styles or pixel art when it came to actual production art. It wasn’t for another year that I gave my first real attempt at creating some 3D art: a simple scene I had doodled of a small cottage with a covered stall housing a large snail. I had taken an intro 3D class in college years before, so I had some sense of where to start, but tackling such a different workflow was quite a challenge. I even had stress nightmares about unwrapping and UV layouts! But once I figured out enough of the technical aspects to finish it all up, I adored the end result. In creating 3D art, I had found this happy joining of technical accuracy, 2D painting, and some clever post-processing wizardry that I fell in love with. It didn’t take long for me to decide that 3D environment art is where I would stay. My biggest artistic goal is getting to help create fun, immersive, and visually unique worlds for others to experience. To me, video games are the best medium for achieving this goal, as players can be much more involved and interact with the story and environment around them. 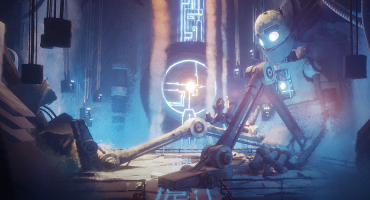 I’m especially interested in games that explore more interesting visual styles; games that use vivid color palettes, more abstract geometry, or stylized texturing techniques. While the technology that powers hyper-realistic graphics is incredibly cool, I think the true strength of video games as a medium is creating worlds and experiences that can’t exist in reality. These are the sorts of games I want to work on, and all of my practice and study is working towards that goal. Nearly all of my skills have been self-taught, and while I’m proud of what I’ve accomplished given my education and degree in a different field, that fact can lead me to doubt my skills and bring on feelings of the dreaded imposter syndrome. When that happens, I remind myself to take a step back and see how far I’ve come since first starting my journey as a “programmer who kind of does art” to being comfortable with just calling myself an artist. It also helps to know that so many other artists struggle with these same feelings and that I’m definitely not alone. Another struggle of being mostly self taught is dealing with motivation, or lack thereof. Finding communities of like-minded artists where I can share my work and get feedback, or even just a bit of encouragement, has provided some much needed support in this department! Sites like Twitter and Sketchfab have allowed me to make friends, learn new things, and even push myself more than I could on my own: I’m always looking forward to new Sketchfab community challenges! And when I’m feeling stuck or struggling with some aspect of a new project, I make sure to check out all the amazing work here on Sketchfab to see how other artists have tackled their problems — being able to view wireframes, check out a model from all angles, and see how textures are used is a lifesaver for an artist on their own. 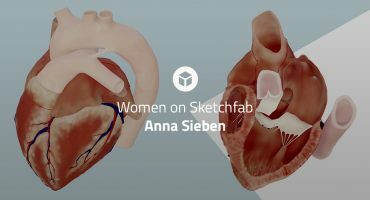 I want to thank Jasmin, Abby, and Mieke for inviting me to contribute to their Women on Sketchfab series. I was so excited when I first heard they were starting this series — it’s amazing to read and learn about all the other talented women artists in this community that I’m so glad to be a part of! As I mentioned, finding and joining communities of like-minded artists is one of the most empowering things any artist can do, and for me personally, being able to connect with so many other talented and driven women has been such an uplifting experience. Like many other tech fields, games can feel like a bit of a boys club sometimes, and I’m so thankful for being able to connect with other women in the industry. I know I still have a lot to learn, and I may not always see the full path ahead of me, but at least now I’ve found somewhere I belong. 3D prop and environment artist, food lover, certified cat lady. Currently working as a freelance artist for indie games.